'World of Dance' The Duels competitors Elektro Crew. Photo by Jordan Althaus/NBC. The first battle to hit the World of Dance stage was VPeepz vs. Battle Droid Crew. These two explosive groups made for the perfect match-up as they both strived to top each other even during their rehearsals. After an exceptional Qualifiers round performance, VPeepz brought new tricks to their routine to shake things up. They came through swinging with a soccer-themed routine that was pure entertainment from start to finish. VPeepz did an amazing job of dancing as one with precision that was through the roof. With the judges scores locked in, Battle Droid Crew was raring to go as they stormed the stage. They took J-Lo’s note from the previous round to clean things up, and it certainly showed. Battle Droid Crew did not waste any time as they started their performance with death-defying tricks. They took their performance to the next level with more visuals and a bit more dancing throughout the transitions. They tore the stage up with energy that never wavered. With a score of 92.7 for the VPeepz and 90.3 for Battle Droids Crew, VPeepz is on to the Cut round, leaving Battle Droids Crew up for a chance at Redemption. It was contemporary against waacking as Intention battled it out against Get Down District. Two completely different styles were ready to fight for their spot in the Cut. Signature peel-offs in tow, Intention took the stage with a different pace and music choice. They had some fun isolated moments to their routine and even adding waacking to one portion as a burn to the other team. Intention had great technique from one element to the next, but some of the movements got lost in translation with the music choice. With the challenge to tone down their facial expressions, Get Down District took the stage next and started with a bang. Their synchronicity was amazing with energy to match. There was a sassy yet fun vibe to their performance that kept building momentum. Get Down District’s energy continued to soar throughout. It was a close call as Get Down District scored an 88.0 while Intention scored 87.0. Intention held on for a chance at Redemption as the other groups performed. MKAM vs. Elektro Crew was the next match up to grace the World of Dance stage, and it was a battle for the ages. Although one member suffered an injury two days before the Duels round, MKAM hit the stage in hopes of making their teammate proud with a signature hip hop routine that was sure to please. They served up great visuals as they began and continued to build from there with explosive energy. MKAM’s synchronicity was sickening with each transition, and they certainly set the tone. Elektro Crew came to fight as they rounded their turn to hit the stage. They brought a “Thriller”-esque hip hop routine to the table and brought equally explosive energy that gave a whole new meaning to the word “duel”. There was a swag to Elektro Crew that didn’t quit as they mixed grooving into their style of hip hop. They even added tutting as a finishing touch. This battle proved to be another close match up with scoring. Elektro Crew came out on top, scoring a 91.0, while MKAM stood a chance for Redemption later on — knocking Intention out of the running. It was a default duel for the next battle as Dancetown Divas performed against JDC. Because both teams scored an 87.3 in the Qualifiers round, it was up to one of them to officially break the tie and move one step closer to the grand prize. Dancetown Divas, also challenged to work on cleanliness, brought great improvement to their Duels round performance. They took charge of the stage in a hard-hitting number that had the perfect mix of styles from salsa to jazz. Dancetown Divas kept their movements super sharp and were warriors through and through. They set fire to the stage with amazing synchronicity and showed a unified front from start to finish. JDC also amped up their game by adding one simple prop to their routine — mirrors. This go around, JDC served more emotion along with amazing tricks and partnering elements that left the crowd and judges amazed. Their performance was intense and was matched with exceptional technique. JDC took many risks and executed them beautifully which earned them a standing ovation from the judges. In another close round, JDC won the battle with a score of 96.0 and Dancetown Divas were vying for redemption after scoring a 95.0. Crazy 8’s, who stole the judge’s hearts in the Qualifiers and also earned the highest score of the division, picked up the pace for their Duels routine. They served unbelievable flexibility teamed with amazing strength in their high energy jazz performance. The infectious beat was enough to grab the audience’s attention as these little firecrackers lit up the stage with each beautifully transition. West Springfield Dance, the lowest scoring routine of the Qualifiers hit the World of Dance stage next with a creepy clown-themed routine that they hoped would shake up the competition. They served up some creative visuals from the very beginning which caught the judge’s attention. West Springfield Dance brought a fun and comical twist to their creepy hip hop routine with unbelievable isolations and a grimy swag that was full of synchronization. Though they put up a good fight, The Crazy 8’s came out on top, while West Springfield Dance was eliminated. The Redemption round was chock full of intensity as MKAM went head-to-head with Dancetown Divas in a showdown that brought the house down. While they both had to dance to the same song, they knew that this was the last time to show the judges what they were made of. MKAM mixed things up style wise by adding some Latin dancing to their redemption routine. They came out with explosive energy and brought a swag that was through the roof. 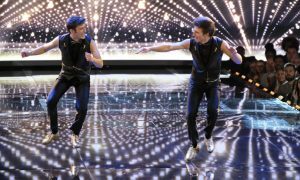 This only fueled the fire for Dancetown Divas as they served the same great synchronicity but ten times better. Their mixture of styles not only complimented the music but brought heat to the stage that the judges had never seen before. While it was a greatly anticipated Redemption Round, by majority vote, Dancetown Divas swept the competition and earned the last spot in the Cut for their division.